Olympia Time: What should Evergreen do with its athletic program? What should Evergreen do with its athletic program? Thanks to @downwithpants for the conversation to kick this off. Dave Weber's seat was barely cold before his successor, Sarah Works is also heading out the door. "It came to a point where my boss’ vision wasn’t mine,” Weber said. There is a push toward recreation sports, intramural sports and outdoor recreation at Evergreen. Yet there are no regrets, just differences of opinion. “We had good support in the sense that most faculty and staff want the teams to do well,” Weber said. “But when it came to stepping to the forefront and truly advocating for a more prominent role for our department, most of that does come from within the athletics and rec staff." Weber's resignation and Works appointment and eventual resignation seems to indicate a flux in terms of what athletics at Evergreen are supposed to be. 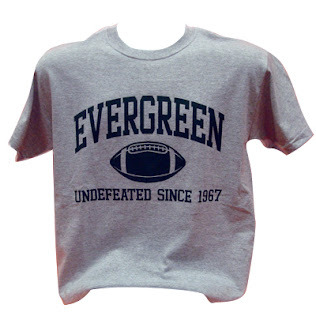 I remember growing up, when there were no varsity sports at Evergreen. My uncle played for the Geoducks soccer team, but at that point was a glorified club team playing locally. Bounce that against the Quincy Wilder led Geoducks, packing the gym seemingly every night. If Evergreen wasn't a good place for competitive intercollegiate athletics, why did it seem that that team (plus any other successful Geoduck team) was popular at the school? The tin-pot band (anyone remember that?) made up of male 19 year old students came to the basketball games back then because the team was good and fun to watch. Even though (we know the old tale of why the Geoduck was chosen) Evergreen was founded as a school that would never embrace big time college athletics, playing in the NAIA seems to be a way to a nice middle territory between Seattle University-esque small college striving and just not trying at all. Weber did a great job for years towing this middle ground between "Undefeated since 1967" attitude and trading in being a college for being a sports franchise. I don't think the Geoducks will ever sell out the way some schools have, but there is something to be said for putting some effort into it. Paralleling their efforts to increase the level of competition , Brigham Young University Soccer left the Collegiate Club division of soccer, and purchased a Premier Development League franchise, where they began play in May of 2003. Part of the United Soccer Leagues, this league provides the year round competition necessary to develop individual and team skills that in hand will better prepare them for success in their international travels. We are the only University sponsored soccer program to ever purchase a franchise and that competes at a level considered higher than NCAA soccer in the pyramid of U.S. soccer development. Is there some future in that model for Evergreen? Creating a side non-profit organization that receives grants from the school to offer athletic opportunities for students. But, can be separate from the school and be able to raise its own funds as well. And, by looking for opportunities to compete at a high level in non-college venues (PDL, WCCL or IBL), it could still play at a high level. And, just another thing: Don't you think an institution with its own blog farm could put up a simple RSS feed for its athletic department?